1. Don’t send the standard connection request, always personalize. When you’re on LinkedIn on your desktop, you’re given the option to send a personalized connection request when you add a connection. Utilize that feature! If you’re connecting to someone that you maybe saw speak at a conference or even someone you went to highschool with, let them know how you know who they are. 2. Don’t spam your groups. Make sure you’re providing value, commenting on other people’s posts, engaging in discussions. It’s a great way to share the different blogs and sales you have but you’ll get way more of a response from people if you have also been commenting on their posts. Then, when you post about your business or the different things that you do, people will see your name, remember it, and be way more interested in what you have to say. About 70% of the time you spend in those groups should be adding value to others’ posts, not just about you! 4. Don’t skip over the summary! This is where you can tell your story, where you can intrigue your followers, where you can share a call to action. All these words you use in your summary are searchable by google. Make sure you are throwing in some keywords that really summarize you and your business so that when people search it, you’re the first to come up! This is a way for your LinkedIn to work for you while you’re sleeping, it’s way too simple to skip over it. Keep it clean, relatively short, and feel free to keep a lot of white space in your summary so it’s easily read and skimmed. 5. Don’t forget to check your privacy settings! This is such a simple fix that can easily slip by you. If your profile is private, that is not helping you be seen by the masses. Make sure you set your profile to public. Go right now and just double check, this is another incredibly simple way to increase the traffic on your page! 6. Don’t ignore recommendations! Of course it’s great to write a review for your hairdresser or your personal trainer, but don’t be afraid to write recommendations for people who can write one back for you! So if you collaborated with someone and you think that partnership went really well, write them a LinkedIn recommendation and more than likely they will write one back for you. Recommendations are gold on LinkedIn and they really make you stand out from your competition. Customers are much more likely to trust a professional that has been recommended by plenty of people that they have worked for or with. If I speak at an event and someone running it comes up and says “Hey, thank you so much you really did a great job and everyone seemed to love it!” I’ll come right back and say “Of course! Thank you and would you mind writing me a recommendation on LinkedIn?” and 9 out of 10 times it I come out with not only another speaking gig under my belt but a glowing LinkedIn recommendation as well. And that’s about it! Six easy tips that I swear by that can totally turn around your LinkedIn game. 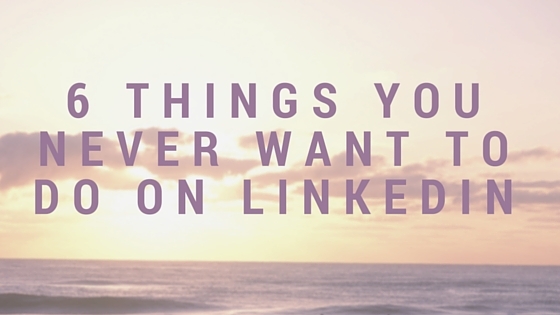 Do you have any other LinkedIn tips you swear by? Let us know! I’d love to hear your thoughts!! Want more tips? Join my LinkedIn group! Karen… Thank you X’s 3 !!! I watch for your emails and derive such great value from your weekly posts. So nice to hear Deborah! Glad it’s helpful. Thanks for the good reminders Karen. I need to reach out to do recommendations. I publish articles weekly to gain credibility and exposure. Yes! Do that. You’ll be glad you did. Thanks Simon, and thanks for sharing all over social media!